For cooler days we recommend the kind of stuff you’d wear to a regular yoga class that will move with you and dry quickly if you get wet. In the warmth of summer, a bikini and board shorts (and of course, sunscreen) will do just fine. There’s always a chance you could get wet so come prepared – bring a change of clothes and a towel! Feel free to bring you camera or phone to take pictures we offer waterproof cases to carry out while on the board! If you want to pack a lunch then feel free to bring a cooler and sit back relax and enjoy the view on our patio after your class! What exactly is “SUP Yoga”? SUP (Stand Up Paddleboard) Yoga is essentially yoga on a stand up paddleboard in the water and an exciting new way to enhance your current yoga practice. Since the SUP board is large enough to act as a mat (and sturdy enough to support someone standing on it) it was only a matter of time before yogis started to discover the ways it challenged their practice. 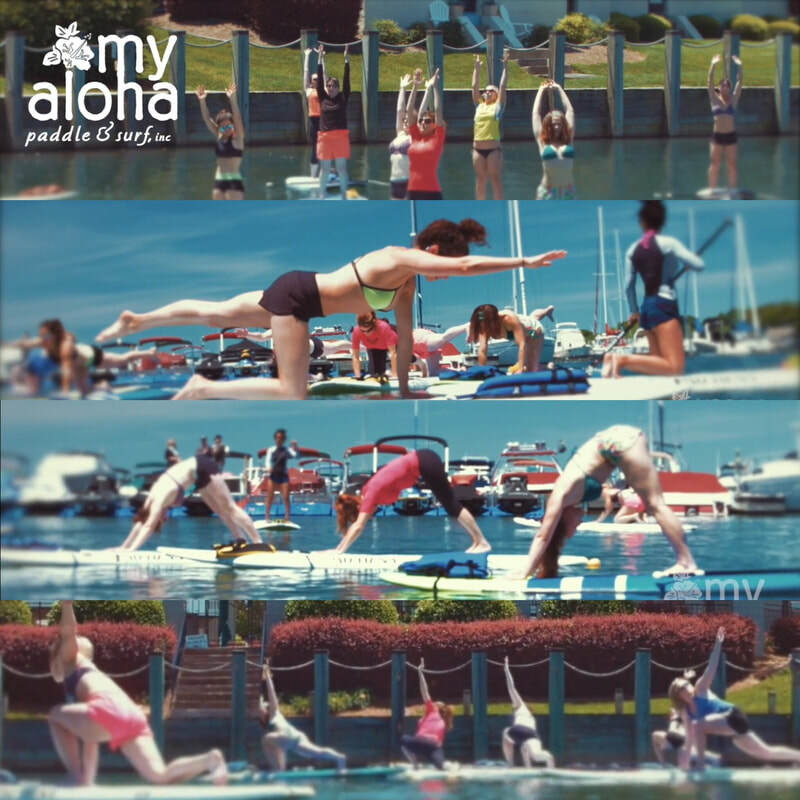 Yoga practiced on a board floating in the water helps you to improve concentration, balance and core strength. *Anyone is welcome to come to a SUP Yoga class even if it is your first time trying yoga, and/or your first time on a paddleboard. What if I have never paddled boarded or taken a yoga class before? We welcome all beginners to our SUP yoga classes! We offer our "Intro Class" that teach the fundamentals of paddle boarding before beginning our practice. This class starts off with a relaxing paddle giving us time to feel and connect with the water then a gentle class with slower movements and instruction for beginners. Is it difficult to stay on the board doing the poses? SUP Yoga can be more challenging than yoga on land because we are on a floating yoga mat, but we learn to adapt and become more aware in the moment which creates better balance and strength. There are different level of classes which pose more challenging postures. The boards are wide and stable which help keep your balanced more stable on the water. What happens if I fall in or is it common that people fall in? We laugh and get back up! Falling in the water can be rewarding and refreshing after we build up heat. After the first time of falling in the fear is gone, and we look at the postures in a new light, without the fear of making a splash!